Above photo is from the March 1962 National Geographic Magazine. 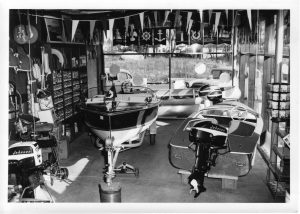 The above photo shows vintage ’50’s boats in the Durland Boat Company showroom. In addition to selling boats and motors, Grumman canoes were also sold. and all types of boat parts and accessories. Building and restoring boats since 1954, the Durland Boat Company provides expert service and craftsmanship. All work is quality and custom.